1. In a food processor, pulse your flour, sugar and salt until it is completely mixed. 2. Cut the butter into thick pieces and add them into the food processor one at a time. 3. Add in the ice water and pulse the dough mixture until it has a crumbly consistency. 4. Roll your dough into a flat disc and wrap it in plastic wrap. Let the dough chill while you get your other ingredients together. 5. Preheat your oven to 425 degrees. 6. In a large pot, add the broth, carrots and potatoes and bring them to a boil. 7. While you’re waiting for your broth to boil, sauté the onion in olive oil over medium high heat. Once your onions are sautéed, add them into the broth. 8. Once your broth is boiling, add in the broccoli, celery, almond milk, chicken and parsley. You can also add in salt and pepper to taste. 9. Grab the chilled dough and roll it out into four equal discs. Add one dough disc to the bottom of a pie dish. Pour the filling mixture on top of the dough and add the second disc to the top of the chicken pot pie. Do this for a total of two pies so that you can eat one tonight and freeze one for later! 10. Bake your chicken pot pie for 25 minutes, or until the crust is golden brown. Enjoy! That was easy, wasn’t it? 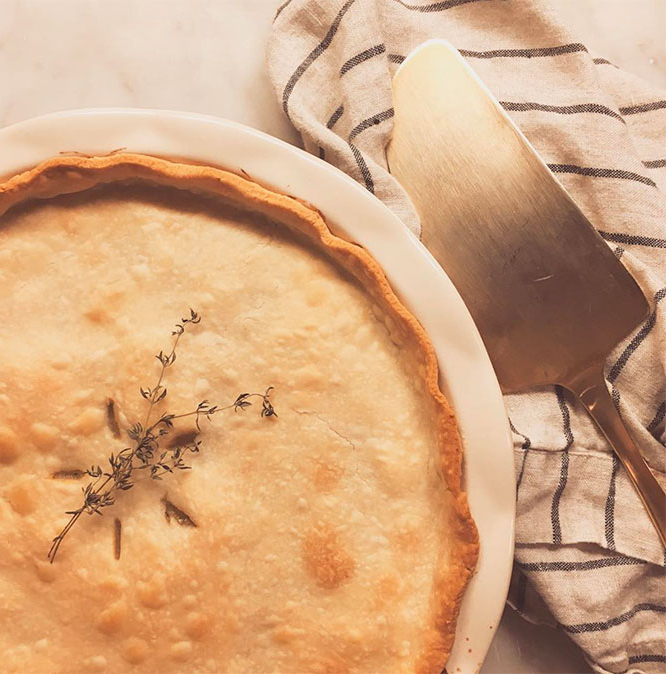 Since this recipe yields two pot pies, I always freeze one for later in the month. There’s nothing better than getting home from a long workday and having dinner ready for you in a matter of minutes. Do you have a favorite recipe that you can’t get enough of?